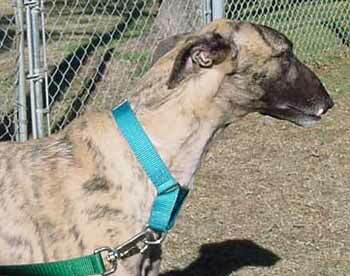 Wolf, aka AZ Wolfman, is a three-year-old brindle male with a Roman nose like you've never seen before - it gives him the "enforcer" look, which duplicates his athletic career.....a Class A racer for over 1 1/2 years at Victoryland in Birmingham and Gulf Greyhound Park in La Marque. Wolf is a smaller male, with a very, very loving and affectionate personality. That glorious muzzle of his is shaded in black, making him all the more dashing and debonair, with the cutest exposed bottom tooth! 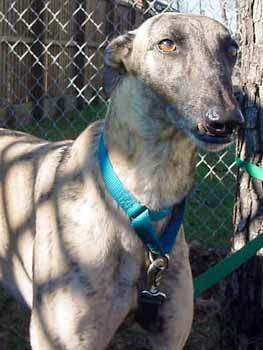 You must meet Wolf--he is one handsome, fun and happy boy!